I think there is something Divine about art, the act of creating, working with our hands, our bodies. And I think there is something Divine about how we respond to art. Whether or not we are capable or willing to submerge ourselves in its message, feel what it wants to express – those things determine whether you appreciate art, or whether it moves you. In my writing, I do not follow strict outlines, or even the rules of grammar or spelling sometimes. I use slang, nonsense words, and write in a conversational style that probably makes most English majors wince. But it is my art. I take liberties with it to best express what I’m wanting to convey. And I relish the lack of restriction in this medium. 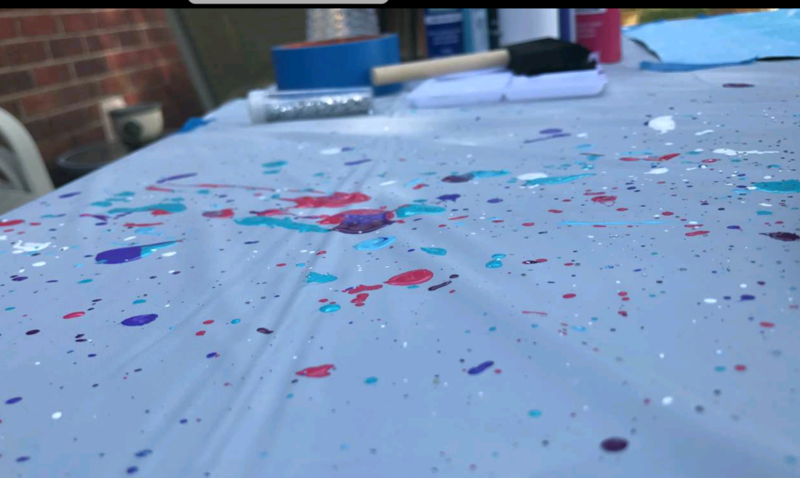 This past weekend, after talking about it all week, Reagan bought herself some paint, brushes, and canvases and was painting at 10:30 p.m. Saturday night. She had no real idea of what she would be creating; it was very freeform, and she was giddy with happiness about it. Since art is a stress reliever for me, I purchased two coloring books (on clearance!). I haven’t colored since Reagan was little, and when I was a child, I didn’t particularly enjoy it. I could never stay in the lines. But I stayed up until midnight working on a page in that book. I haven’t been able to put together a blog post for over a week, feeling stuck and stagnant. And using those freshly sharpened, brightly colored pencils to bring a black and white page to life….was good therapy. And started knocking down some of the obstacles in my creative writing path. But I had to get there through means that stretched my comfort zone. Because I still have trouble staying in the lines. And forcing some patience and order into my scattered thought process brought about some peace and helped reorganize my chaotic mind. I’ve been thinking all week about the healing power of art. How art and divinity seem to go hand in hand. What art can teach us about God, and one another. Last weekend, under one roof, I watched black people and white people, gay people and straight people, conservative and liberal people, and all manner of the unlabeled, come together to sing, dance, and worship. And it was all because of music. Which is art. Which is, in my opinion, one of the ways that we, as humans, help to bring the kingdom of God and Love to this earth. By using our creative gifts of expression. They are powerful. Both to us, and to a world that seems more divided all the time. 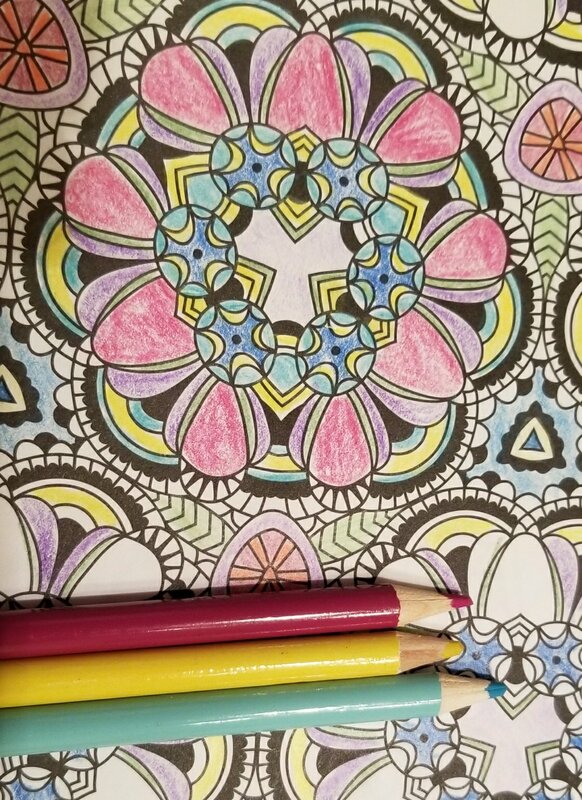 Reagan sat with her acrylics and I sat with my coloring pencils and we enjoyed companionable silence last weekend as we created. Her freeform, my inside the lines – both beautiful, both colorful, both providing healing and comfort to their respective creators. Neither of us was right. Neither of us was wrong. We just made beautiful things. Together, yet individually. And, I suppose, that’s why I believe art is such a gift of a Higher Power. Because it’s not binary. It’s bigger, more complex, yet more simple than what we try to make it. Our human nature is to make everything fit into the parameters of what we understand or already believe. But that, like art, will determine whether you merely appreciate that which is holy, or whether it moves you. As I watched Reagan with her brush, she painted the middle of a page, then took scissors and cut off the part that didn’t fit her creation. And I see myself doing that, needing to do that, more and more. I have lived under the weight of obligatory and dualistic thinking all of my life. But I don’t think that’s how we are meant to live. I think we are given this canvas, and it’s up to us to create something beautiful. And, from time to time, we have to carefully cut away that which no longer is useful or needed. Also, as artists, it isn’t so much what we create, but how we create it. If it comes from a place of passion, inspiration, truth – that always comes through. On the canvas, in the words, in the music. Yesterday, our organist was out of town, and our entire service was acapella. It was outside my comfort zone, because the music is one of my favorite parts of our service. But the absence of the familiar made me focus all the more on the other parts of the service. Parts that I often let blend too seamlessly into the liturgy without really taking the time to allow them to soak in. Finally, beloved,whatever is true, whatever is honorable, whatever is just, whatever is pure, whatever is pleasing, whatever is commendable, if there is any excellence and if there is anything worthy of praise, think about these things. Keep on doing the things that you have learned and received and heard and seen in me, and the God of peace will be with you. Find the good, the beautiful in this day, my dear readers. And, if there is none, create it. I too love to color, I need to get a new coloring book. It does help the soul to be creative. I think when I’m creative, I’m closer to my God. Thanks Allison.